National Grid has a new service, and accompanying website, to help us use our electricity better, and to save us money. The Central Maine Power Company has a similar program that we use to monitor our electric use on a daily basis while we are away from the cottage, and find it a great tool. Although, the National Grid system does not break it down daily, they offer a great comparison chart of how many kWh you have used in any month over the past year. National Grid then breaks down your data in a chart to compare your usage to your neighbors within 2.1 miles (average 1.1 miles). The chart shows the neighbors that used the most kWhs , and the least, most efficient neighbors, and just where you stand in comparison. This is a great tool, especially if you have ever wondered just where you stood in all your energy reduction schemes, or what you must do to save. 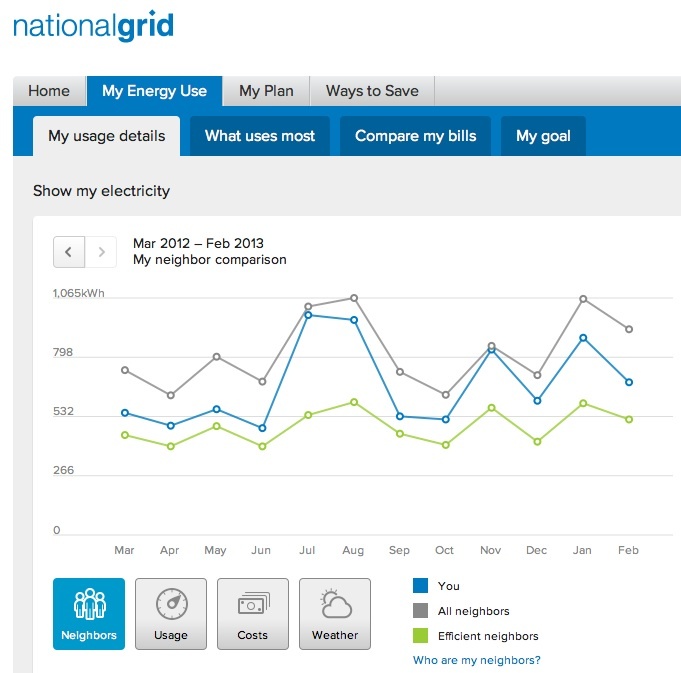 National Grid helps you tailor a plan specifically to your usage, and home. Once you register at https://ngma.opower.com you can click on a variety of options to monitor your monthly energy usage, establish an energy profile for your home, review tips specific to your home, and compare usage in past months in kwhs, and dollars. National Grid is doing a us great service by supplying us a means to see just how we are doing compared to those around us in a similar environment. It's always helpful to see the scoreboard during the game, especially if you have your mind on winning. Even though the chart shows your “neighbor” usage it’s just comparing apples to oranges. The company doing this “research” for Ngrid has no idea who is using electric space heaters, electric H2O heaters, electric stoves, solar generation, etc. In my opinion it’s just hype to make us feel good or bad depending on where you fall on the chart. The type of appliances being used, and the manner in which they are used is not so much the point in this chart offered by National Grid. What the chart is showing is your actual kWh consumption compared to your neighbors (within 2.1 miles) that use the most kWh, and the least. Your usage will be lower if you take steps to lower it, and it will be on the high side if you don't. A true no brainier, but for some of us having the results if our actions in a comparative chart form is helpful. Best of all, unlike the energy we consume, this service is free.